So it is almost November and we STILL have not closed our swimming pool. We must be the only home in the entire state of Ohio that hopefully thinks we are going to have one of those 90 degree Indian summer days in the next week or so. Let me clarify: We have NOT gone swimming ONCE this entire summer. In fact, I think the only time anyone was actually in the pool on purpose was the before mentioned story of the coins in the deep end during Christina’s 22nd birthday party. And I do think the main reason we didn’t swim is because it is so darn large. It is about 9 feet at the deep end and it takes a-long-time for the sun to heat all that water up. Like 7 months of hot weather. Which would be very unusual for Ohio, I think. Unlike the neighbors above ground 4 foot pool they put up in their backyard every year. I sometimes wonder if they would be confused if I asked myself over to enjoy it? And we are all getting a bit tired of skimming out all the leaves from the pool. To be fair, my husband does have a reason for not closing the pool. And it is this: He is tired of having to purchase pool cover sump pumps all winter long. For some reason, we just go through them like water (get it?). So in his research he has discovered this idea of using an inflatable ball that goes under the pool cover that will result in no water being caught in the middle. That costs like $200. Don’t get me wrong, I like the premise; I just wonder if he couldn’t jerry-rig something like it using a large fitness blow up ball, duct tape and rope. For about $30 bucks. (Trust me, this is a man who could make a wet vac from a pail, scissors and hair dryer). So we wait until he orders this contraption from the Internet. And in the meantime I guess we will have to keep skimming off the leaves, spiders, grass and weeds. I have already told him that if this works it will be totally his responsibility to explain to our cat that he will no longer have the pool cover water entrapment puddle as his personal drinking bowl. 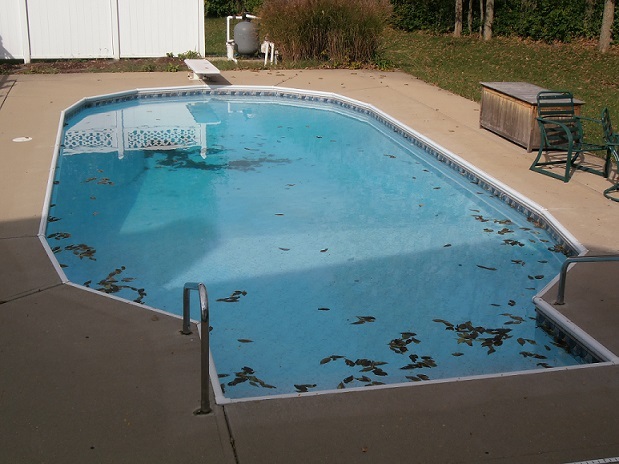 This entry was posted in Uncategorized and tagged cleaning the pool, closing the swimming pool for the winter, leaves, skimming, sump pump, Swimming Pool. Bookmark the permalink.